Oakfield Wind Farm uses 48 Vestas V-112 turbines. Image courtesy of Vestas Wind Systems A/S. Each turbine of the wind farm has a capacity of 3.075MW. Image courtesy of Vestas Wind Systems A/S. The Oakfield Wind project is located near the town of Oakfield in Aroostook County, Maine, US. Image courtesy of Huebi. First Wind, a part of SunEdison, developed the project and Oakfield Wind is the company’s sixth wind farm in the state. The project was acquired by Terra Nova Renewable Partners, a partnership between SunEdison and J.P. Morgan Asset Management, in December 2015. Construction of the $369m onshore wind power project started in late 2013 and commercial operation began in the fourth quarter of 2015. 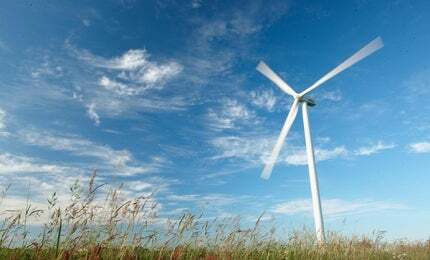 The wind farm is expected to generate enough clean energy to power around 50,000 New England homes, while offsetting more than 160,000t of carbon dioxide emissions. The project created 300 full-time on-site jobs during the construction phase. "The wind farm is expected to generate enough clean energy to power around 50,000 New England homes." First Wind and Canadian utility Emera formed a joint venture (JV) called Northeast Wind Partners in 2012 to finance and build four wind projects in Maine, including the Oakfield Wind project, the Hancock Wind project in Hancock County, the Bingham Wind project in Somerset County, and the Bowers Wind project in Penobscot and Washington Counties. Emera contributed $333m to the JV in exchange for a 49% equity stake in the four projects and Northeast Wind Partners subsequently received approval from the Maine Department of Environmental Protection (DEP). In March 2014, however, the Maine Supreme Judicial Court nullified the partnership between First Wind and Emera due to a 2000 Restructuring Act in Maine that disallows utilities from both generating and transmitting electricity. Following the Supreme Court ruling, the DEP requested financial assurance for the four affected projects in the absence of Emera. First Wind then began looking for new funds and announced the financial closure of the project in May 2014. It was financed through a $237m construction loan arranged by KeyBank National Association and $132m of equity contribution. Oakfield Wind comprises 48 V112-3.0MW wind turbines from Vestas. Each turbine has a rated capacity of 3.075MW and a rotor diameter of 112m. The V112-3.0MW is a pitch-regulated variable-speed wind turbine with 54.6m blade length and up to 84m hub height, providing a swept area of 9,852m². The cut-in and cut-out wind speeds of the turbine are 12m/s and 25m/s, respectively. The turbines were manufactured at Vestas’ Colorado factories and delivered to Oakfield in the second quarter of 2015. "Vestas was awarded the turbine supply contract for the Oakfield Wind farm in May 2014." Electricity generated by the Oakfield wind turbines is collected at 34.5kV and amplified to 115kV at the Oakfield Collector Substation, from where it is transmitted via a 59-mile (95km) transmission line that passes through the towns of Oakfield, Linneus, Haynesville, Glenwood PLT, Reed PLT, Macwahoc, Mattawamkeag, and Woodville. This connects to the Keene Road Substation, which is owned by Emera Maine in Chester. The power is then fed to the existing Bangor Hydro Electric grid. Custom-designed synchronous condensers systems are utilised for the grid in order to deliver optimal power to the consumers. Four Massachusetts utilities, namely NSTAR, National Grid, Western Massachusetts Electric Company, Fitchburg Gas and Electric Light Company, signed a 15-year contract with First Wind in September 2013 to purchase the power generated by Oakfield Wind at cost-competitive rates. Vestas was awarded the turbine supply contract for the Oakfield Wind farm in May 2014. The contract also includes a ten-year service agreement to maintain and repair the wind turbines. Reed & Reed is the balance of plant (BOP) contractor for the project. Maine GenLead, an indirect and wholly owned subsidiary of First Wind owns and operates the transmission line. GE provided Synchronous Condenser technology for the transmission of electricity from the project. AP+M operates as one of the largest worldwide independent stocking distributors of aeroderivative and heavy industrial gas turbine engine (IGT) parts, and stocks more than 10,000 different part numbers. AP+M is able to meet customers' needs for GE Frame Series consumables and hardware gas turbine parts by combining its extensive, in-stock GE and Siemens turbine parts inventory with fast access to reliable, global sourcing partners. AP+M provides an expansive stock of aeroderivative turbine sensors, probes and accelerometers for GE LM Series and Pratt & Whitney engines installed across the power market.